Code cylinder pocket on outside of upper-middle left arm. Rectangular pocket with a flap closure on upper-middle right arm. Flap should be rectangular shaped. Comm pad pocket on outside of left forearm above wrist. Thigh pockets with rectangular flap closures (upper set required, lower set optional). Mandarin-style with pointed tab closure. Collar closes from left to right with the exposed tab on the right side of the throat. Cuffs should close in a similar fashion as the Mandarin-style collar. 2. Mid-calf black boots (Jack boots or engineer boots are acceptable). Leather pull-on style preferred with low heels. Boots should be largely unadorned. No laces or ankle buckles (small buckle at top edge of boot allowable if covered by blousing). No non-black zippers. Any zipper closure must either be hidden or on the inside of the boot (that is, front and outside zippers are not permitted). High-Calf boots are acceptable with sufficient blousing of the flight suit legs. 3. Silver/grey leg flares in an olive drab or black leg-band holder. Maximum of 8 flares per holder. Flares and flare holder should be approximately 4″ (inches) long. Metal leg flares are preferred, but other materials are permitted as long as, when finished, give the appearance of being silver metallic in appearance. Leg flares should be spaced equidistant around the leg. Leg flares can be worn on either leg and should be positioned to so the bottom edge of the leg flare is resting on the top of the boot (that is, no gap between the flare holder and the top of the boot). 4. Light grey/silver grey ejection harness and web belt. Harness and belt are made of strapping material that is 2” (inches) wide. Front and back straps extend up the torso under the flack vest and are secured to either the flightsuit or to the inside the flak vest panels. Attachment must be hidden by the flak vest. The lower part of the harness should fall (or loop) just below the inseam (or crotch area). Two loops of strapping are connected to the front-back strapping (at the lowest part of the front-back loop) and loop around each leg, drooping no lower than the knees. The belt is worn over the front/back harness strap and is closed with a silver/gray “cargo slide” (or roll pin) style buckle. The free end of the belt is looped around the slide so that the excess belt is on the underneath/inside of the belt, not on top/outside of the belt. The right side of the belt contains 6 (six) vertical loops for mini-flares. Mini-flares are made of metal or other materials that, when finished, have a metallic silver appearance. 5. Flak Vest, consists of white front and back cloth (ballistic nylon or similar fabric) panels. The bottom of the front and back panels are even and should completely cover the chest while not extending toward the waist any further than one-half to two-thirds the distance from the arm pit to the waist, and should allow for approximately 3” (inches) of visible flightsuit above the top of the belt. The front panel has a series of horizontal ribs. The ribs are created by inserting 0.25″ (inch) OD tubing (or similar sized material) through fabric tubes prepared for the tubing. Ribs are separated from each other by a space that is the same width as the finished rib. Two equally spaced ribs at the top (near the collar). Immediately below the two top ribs there is a flat wide area with eight horizontal rows of top stitching that is approximately 0.25″ (inch) apart (for a total of approximately 2” (inches) of flat area). This area is sometimes referred to as “The Gap”. The remainder of the front panel, below the “The Gap” just described, contains a minimum of 8 – 9 ribs (total number of ribs will depend on the size of the wearer) that continues to the bottom edge of the front panel.Note: The side strap (described in 5.g. below) does not cross over the front panel. Vests with a missing rib on the lower front panel will not be approved. The back panel has a minimum of 16 equally spaced ribs (based on Luke’s ANH flak vest), again, the total number of ribs will depend on the size of the wearer). Again, the ribs are created by inserting 0.25″ (inch) OD tubing (or similarly sized material) through fabric tubes prepared for the tubing. Ribs are separated from each other by a space that is the same width as the finished rib. In addition, “The Gap”, as seen on the front panel is NOT present on the back panel. Ribbing on the front and back panels stop no more than one inch from each side (on left and right). The shoulder straps are approximately 2″ (inches) wide and sewed in place to the inside of the flak vest panels, thus joining the front and back panels together. Each shoulder strap has rows of horizontal top-stitching (each about 0.25″ (inch) apart) across the short length of the strap (or perpendicular to the length of the strap). These stitches cover the entire strap, from front to back. The under-arm straps have one silver “press-release” style buckle on the left and right sides of the vest. The female half of the buckle is sewn to edge of the front panel. The male end is sewn to the end of the strap. Each strap continues back under the arms, and passes through a short sleeve sewn above the second or third rib from the bottom of the back panel. The left and right straps meet in the center, and are adjusted with a black/dark-grey “strap adjuster” style buckle. The excess strap lengths are either trimmed to length or tucked into the sleeves to present a neat appearance. These side straps should ride approximately 2″ – 4″ (inches) below the armpit depending on the size of the wearer. Be careful when checking references. 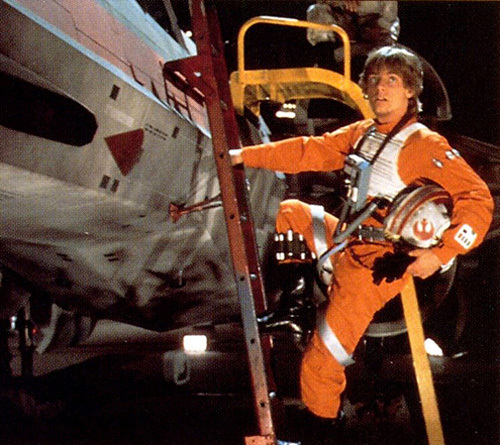 When filming The Empire Strikes Back, the flak vests were worn “backwards” when compared to ANH and ROTJ.Note: Please be aware that flak vests from commercial vendors must meet costume standards and be screen accurate. Some commercially available flak vests require extensive modifications for approval. Raised buttons (acrylic preferred) with acceptable color schemes. Accurate knobs (metal or other materials that when finished have a metallic silver appearance. ), details, pin stripes etc. 1″ – 1.25″ (inches) diameter ribbed grey hose or aviation hose. One end of the hose should attach at the left-bottom of the chest box and the other end should connect to the suit in some screen-accurate manner (tucked up into the flak vest, attached to flightsuit, etc.). Chest box is secured around the collar and the back with olive drab nylon/polypropylene/polyester/cotton(canvas) straps. The strap around the collar has no fasteners. The strap around the back has a silver or black “strap adjuster” style buckle in the back. Excess strap from should be either trimmed or otherwise hidden to present a neat appearance. The Chest box is worn low on the chest (with the top of the box near the bottom of “The Gap”) so the bottom (around the back) strap passes below or along the bottom of the front flak vest panel. (LINK TO PILOT FORUMS where box design pics are located). 7. Code Cylinders (Arm Tools) in left shoulder pocket. Two minimum, four maximum. Metal or other materials that when finished have a metallic silver appearance. Cylinder heads showing should resemble screen accurate representations. Leather or pleather gloves preferred. Cloth or rubber gloves are not permitted. The cuff of the gauntlet must present a “flared” appearance when worn. 9. Accurate Comm Pad (size, details, 3-dimensional, coloration, etc.) visible in the comm pad pocket. 1. X-Wing helmet with Star Wars-style decoration. Helmet has a Mohawk design and raised side panels as seen in the films. Trapezoidal cap on the front of the Mohawk with the appropriate design. Amber or dark grey colored visor covering the eyes (maybe be fixed or movable). White chin cup with black elastic straps. Elastic straps should be fixed to the inside of the helmet. Black weather stripping around the “ears” and neck borders. Paint scheme, including pin stripping and decorations should resemble those seen in the films. Blatant “modern-world” or other sci-fi-fantasy genre images/designs are NOT permitted. Helmets should look as though they belong in the Death Star Trench sequence. Tutorial for Pilot helmet assembly is found here. Original Trilogy Pilot Helmet Gallery is found here. 2. Mini-flares on belt. A mix of filled and empty slots are okay. Metal or other materials that, when finished, have a metallic silver appearance. 3. Accurate belt buckle on web belt, as described in 4.d. NOTE – All references above to “screen” or “accurate” are indicators that you should be comparing and matching closely to screen-cap reference examples. Always refer to reference pictures for details of construction.